Room Dividers Control Traffic Flow. W. Kim Taekwondo uses Screenflex room dividers for traffic flow, and to lessen distractions. Here’s a great example of how an organization can use room dividers in multiple ways. 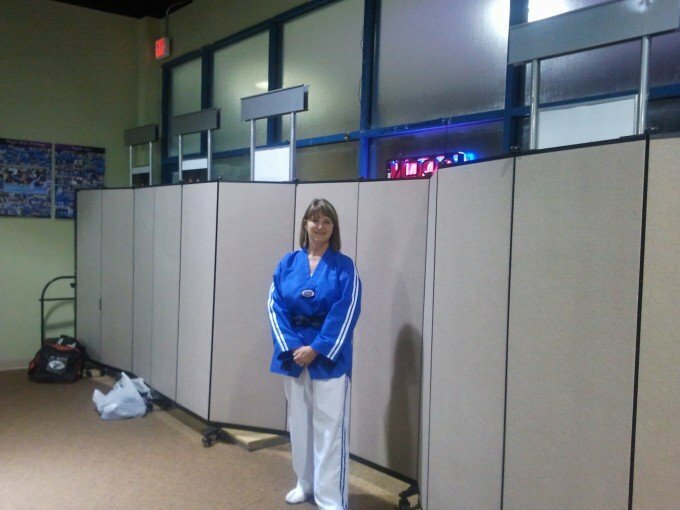 On a regular basis, one or two dividers are set up to provide two spaces for training and Taekwondo instruction. Room dividers act as a barrier to lessen sound and sight distractions between the groups. For kids who meet their goals, W. Kim throws a pizza party celebrating student success. It’s a fun way for kids to work hard towards a goal and be rewarded. I’ve heard that the best part about the pizza party, is when each student gets to break a board. Sometimes a divider is set up between the tables and sparring room. The dividers provide a nice screen so the hostess can set up the food for the party without distracting the students. The divider is easy to fold up and stores in a small space in a closet or corner of the room. During testing week extra classes for review are held at the martial arts school. As you can see in the photo, one 6′ room divider acts as a wall to control the traffic of people coming into the school and lessen distractions for students as they practice their forms. Thank you for sharing your picture! We welcome all “in use” photos and “before and after” photos to help our customers see all the great ways you can use your divider! Share your use story with us! Send your photos to [email protected].com and as a way of saying thank you, we will send you a display kit to go along with your room divider.